There are certain times of day to do certain types of things in Paris. There are meal times, and these are observed. Breakfast is at breakfast time, lunch is at lunch time and supper is at supper time. You can indulge in a cake if it's been 4pm and 6pm at a push, but if you miss the bus, you ain't getting no food until the next allocated eating time. Furthermore, meals are eaten à table and not wolfed down any old how. Drinking however has long been done standing up at the bar or "le zinc" as it's called. 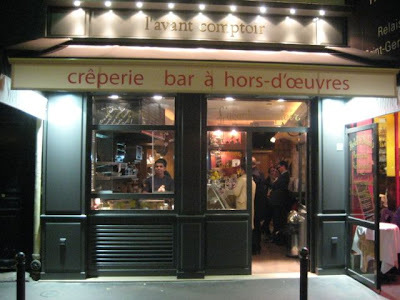 And this is where the eating-rule loop hole comes in to play, and it is exploited fully at Paris' new wine bar L'Avant-Comptoir...You can stand at the bar having a drink, and order tapas-style food to accompany your wine, pretty much at any time of evening. Pop in for an apero, and sample some succulent Lucca olives with your glass of white selected from the small but well chosen wine list , or rock up ravenous and order cheese, cured ham, anchovies and pate to go with your red. Help yourself to the fresh bread, butter and gherkins on the bar. The charm of L'Avant-Comptoir is in the laid back a la bonne franquette style - you turn up without a reservation, you hover at the bar, talk to the people next to you as you ask them what they've just ordered, chat to the people working there as you ask their advice on wines, and eat simple, good quality hors d'oeuvres.